Alan Turing has had quite a renaissance in the last couple of years, as his accomplishments and travails have been celebrated in the media and the Queen of England apologized on behalf of the man's home country for the persecution that led to his suicide some sixty years ago. Though, as my friends who are more in touch with computer-type things tell me, Turing should have been on my radar long ago. Cinema fans know his work indirectly. You know that scene in Blade Runner where the replicant reveals himself after as series of abstract questions? "The tortoise lays on its back, its belly baking in the hot sun, beating its legs trying to turn itself over, but it can't"? That's a version of what is called the Turing Test, a theory that the inventor cooked up for how one could differentiate between a man and machine, back when artificial intelligence and, hell, this very laptop computer I am typing on, must have seemed like the stuff of the most far-fetched science fiction. In truth, Turing's story is both incredible and tragic, and though it is already a matter of public record, I suffer a certain trepidation in how to outline what this biography picture, The Imitation Game, is really about. Because for the unknowing or the semi-knowing, such as myself, the plot of Morten Tyldum's drama is full of twists and turns that have all the surprise of a wartime thriller. The script for The Imitation Game, which writer Graham Moore based on a 1983 book by Andrew Hodges, juggles three separate timelines: Turing's time in school, somewhere in early adolescence; his work during the second World War; and the final years of his life, when a scandal over his homosexuality destroyed the brilliant mathematician's life. Which I suppose is a kind of spoiler, as Tyldum and Moore withhold his sexual orientation for much of the movie, a decision that I think could be argued is a bit of a mistake. The richness of Turing's accomplishments shouldn't rely on a tawdry "Ta-da!" revelation. 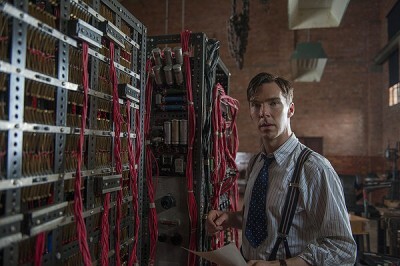 Benedict Cumberbatch (TV's Sherlock, Khan from Star Trek: Into Darkness) stars as the adult Turing in what might be the actor's most carefully constructed role yet. 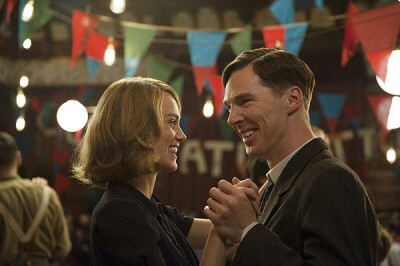 He plays Turing as shy, stuttering, perhaps autistic, and wholly confident in his own abilities. As we meet the man, he is interviewing for a job in British Army Intelligence, where he will join a team working to crack Germany's code system. The Enigma Machine is a device that the Nazis use to encrypt and decrypt their messages, but the settings change every day, leaving a staggering number of combinations to unlock to find the right one. Turing suggests that another machine is the only way to beat the Enigma, as human brains can't possibly process the many calculations at a useful speed. His insistence that this will work alienates his teammates, but he eventually finds the ear of a spy higher up the chain (Mark Strong, Zero Dark Thirty). 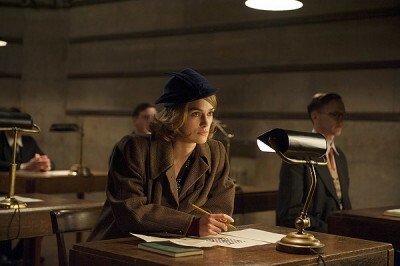 With his budget and position secured, Turing recruits a new ally, a young woman (Keira Knightley, Laggies) with a facility for math that rivals even Turing's own. He offers her an opportunity other men would not, and she in turn befriends him and teaches the social misfit a little bit about working with other people. It's a really positive relationship to see on screen, two outsiders redefining what's "inside." Knightley is effortlessly charming and herself as assured in the role as Joan Clarke, the woman she is playing, must have been in real life. As the Turing group races against time, so too does Tyldum add a sense of peril, as we know that the post-War Turing is under police scrutiny. How these two timelines will converge, and how the childhood experiences will inform the man in his later life, is The Imitation Game's ultimate gambit. In some aspects, Moore and Tyldum succumb to the usual biopic problems, drawing easy lines from one moment of influence to something more important later on, and tossing in a few slick callbacks where words from the past come back to haunt or help. Luckily, these moments are limited and not hit too heavily. 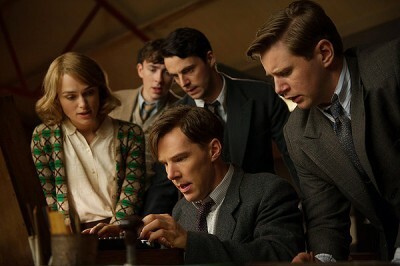 Instead, The Imitation Game is more concerned with the social and political backdrops that came into play for Turing, and the extraordinary accomplishment of breaking the Enigma Machine--not to mention everything that happened next, which is truly a revelation. The criss-crossing of the different periods never becomes jumbled, and it adds some mystery to a tale that, as mentioned, many will know the outcome to. What I liked most about The Imitation Game, though, is how clearly it presented Turing's work and achievements, and how the soap opera of his personal life is given second billing. Far too often, movies about brilliant people--artists as well as scientists--gloss over their life's mission in favor of opening the door on their bedroom. It's why I never really liked A Beautiful Mind. After watching it, I knew that John Nash was a terrible husband, but I was never really clear on what his innovative discoveries actually entailed. I feel the current Stephen Hawking movie, The Theory of Everything, fails in much the same way. Though James Marsh pauses at different times to let Eddie Redmayne drop a little science, these scenes seem more cursory, or even like afterthoughts, with the relationship between Hawking and his wife being given top priority. Not so in The Imitation Game. Maybe it's the benefit of having such a single-minded subject, that he himself never loses focus or gives much time to the other things, he's all about getting his machine to work. Here is where Cumberbatch is a real asset; he is so lost in the role, you barely feel that he notices he is part of an ensemble. His guard drops in the rarest of moments, but usually when the character is sharing an idea or a formula with an equal. You can see his eyes light up when someone else gets it. Thus, while The Imitation Game is imperfect, it's also somewhat extraordinary, informing audiences not just about Alan Turing the man, but also his fantastic machine, and demonstrating that even using the Turing test, it would be hard to separate the two. Order "The Imitation Game" now!